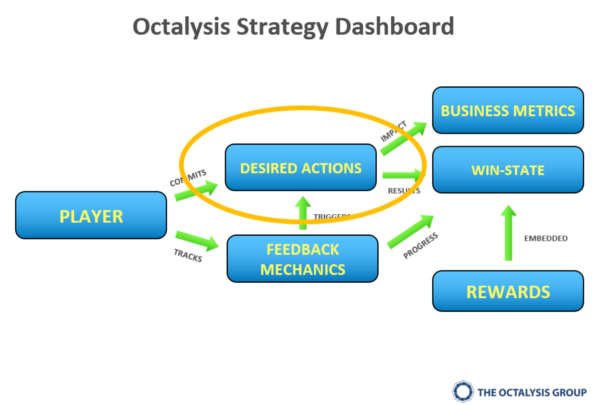 What if you have no money whatsoever to do real gamification the Octalysis way? What are your options if you can only implement a few game mechanics, are you doomed or is there any hope? If you are into Gamification, you have probably heard about Points, Badges and Leaderboards. These are the most common feedback mechanics that we see implemented in a wide variety of experiences. However, there is also a reason why the term “PBL’s Fallacy” exists. Many others so-called “Gamification experts” treat a product or service as a single experience and falsely expect to lead to engagement by only adding PBL’s. Despite knowing that PBL’s are usually weak engagement methods, we believe that if you don’t have the resources to do more than that, you might as well do it the right way. 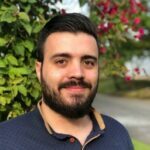 That is the reason we came up with this first post: to teach you how to create meaningful achievements (badges) from scratch! First of all, when we refer to “Badges” in the term “PBL’s,” we are making a direct connection to Achievements since the Badges are just a visual representation of a completed task that is supposed to make your users proud. You might also give trophies, medals, certificates, stamps, etc. and they will serve the same purpose. Some of our clients have already made attempts to design a Badge system. However, in almost 100% of the cases, the Achievements are entirely soulless. The most recurrent issues are lack of difficulty and lack of complexity, so DON’T DO THAT. To come up with Achievements that create real value for your users and ALSO for you, you will need to have a complete Strategy Dashboard. 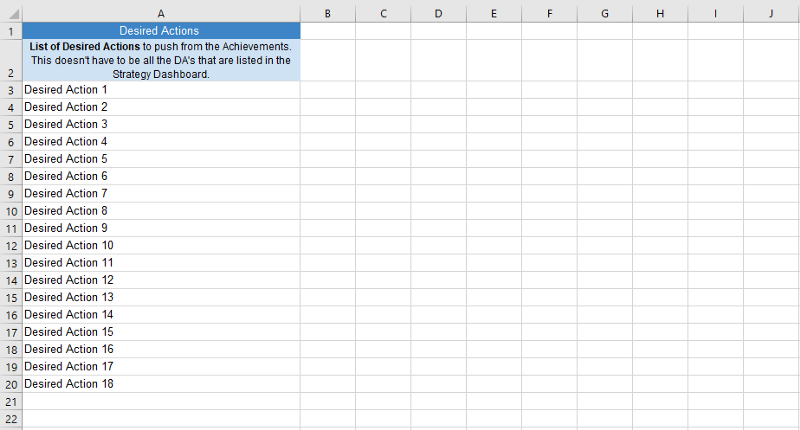 Every successful Gamification activity needs to be based in this document. The concepts required to come up with the Strategy Dashboard are available for FREE online. In essence, the strategy dashboard consists of 1. Business Metrics, 2. Player Types, 3. Desired Actions, 4. Feedback Mechanics, and 5. Rewards. For this first step, we only want to focus on the third part of it: Desired Actions. 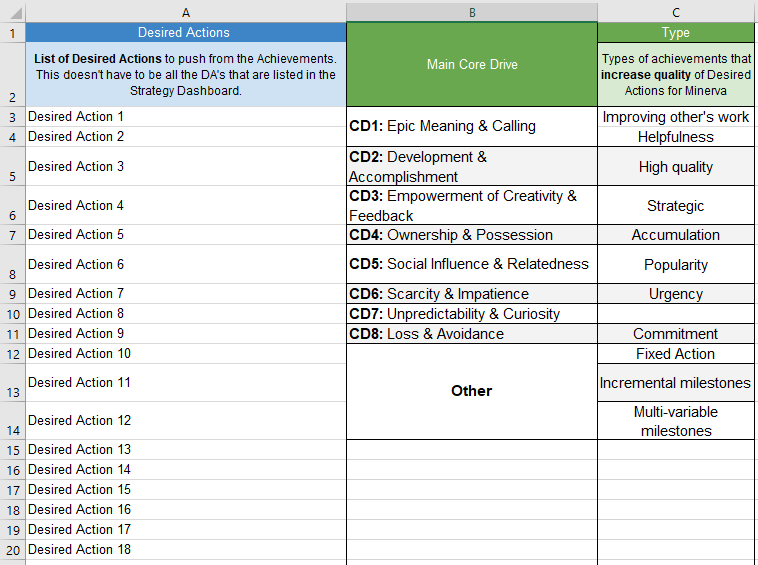 Desired Actions are the third element to define in any Octalysis Gamification campaign. Desired Actions are all the little steps in the user’s journey: go onto the website, fill out the form, register, come back every day, click on the ad, sign up for the newsletter, etc. Whereas the Business Metrics are laid out in the order of importance, you want to lay out all the Desired Actions in chronological order based on the player’s journey. One of the main attributes of an Achievement is its Type. The Type defines the very nature of the Achievement, its core motivation. Of course, when we talk about motivation, we are referring directly to the 8 Core Drives. The second step consists in materializing the 8 Core Drives in the context of the experience. “But HOW can I do that? !” you might wonder…Well, it is simpler than you think. It depends on your particular product, service or experience. Sometimes CD1 is just helping others, contributing to a common (mostly non-profit) cause, choosing to buy a product over another (based on loyalty), etc. CD2 could be achieving different milestones, reaching objectives, and overall tackling obstacles that are MEANINGFUL to the user. Remember that our brains have a natural desire to feel progress, to experience growth, and to see numbers go up. CD3 gives you the chance to engage your users with White Hat, Intrinsic motivation. This Core Drive can be materialized by asking the users to perform any activities that involve creativity and/or strategy (often in games we see this as the “pacifist” type of Achievement). CD4 is based on the principle that because you own something, you want to improve it, protect it, and get more of it. It can be reflected in the real world with things like accumulating currencies, acquiring collectibles that are part of the user’s collection set, or merely owning new things. 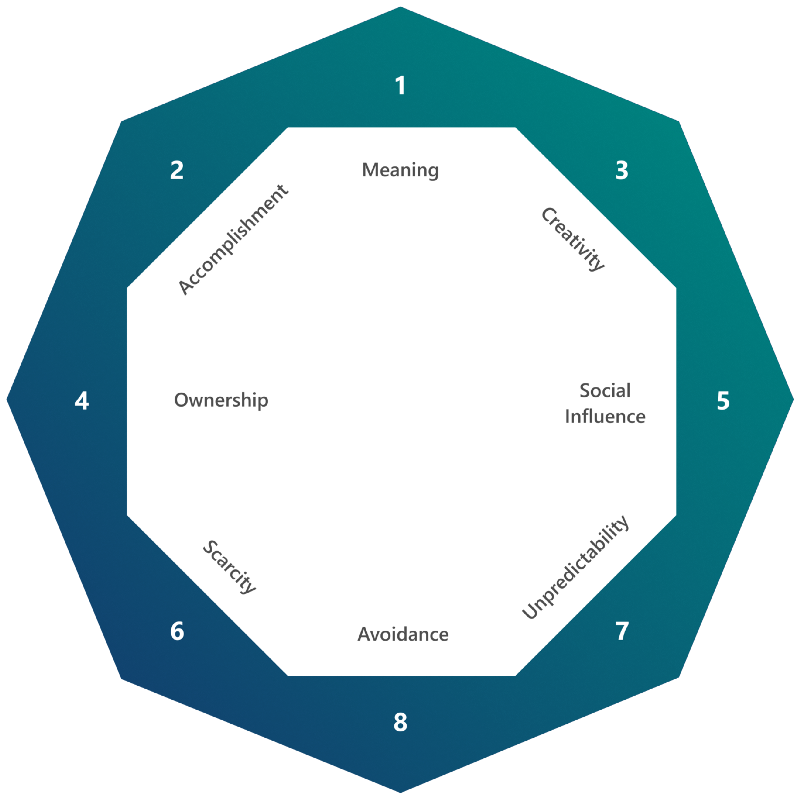 CD5 relates to almost any sort of social activities behind themes like mentorship, competition, envy, group quests, social treasures, and companionship. Interacting with other users is the primary way to recreate this Core Drive in real-world experiences. CD6 can be evoked mostly by creating a sense of urgency like time frames to perform certain activities and even more important to get specific results. You can also think about creating a limited amount of Badges so only a few high-performing players will be able to get them (among other things that generate Scarcity & Impatience). CD7 is the main force behind our infatuation with experiences that are uncertain and involve chance. This Core Drive is trickier to implement as a Type. 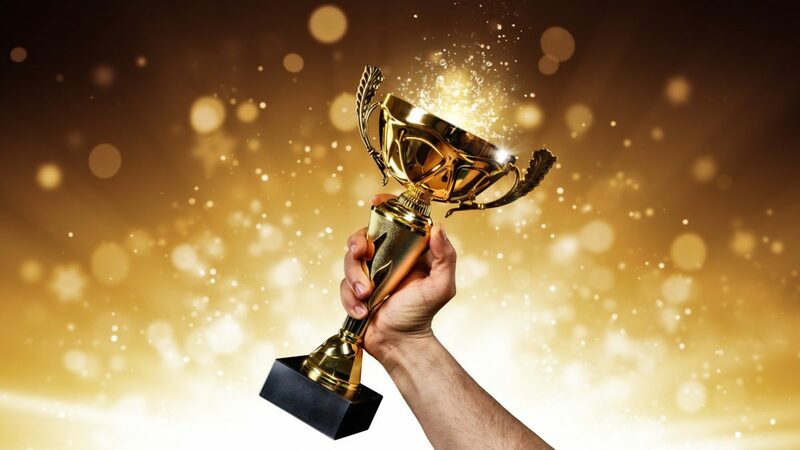 We usually introduce a sense of unpredictability by merging the concept of the Achievement with a Sudden Reward (also known as “Easter egg”). At this point, the user doesn’t know the Achievement even exists, but he will get it after performing without previous knowledge) the Desired Action. 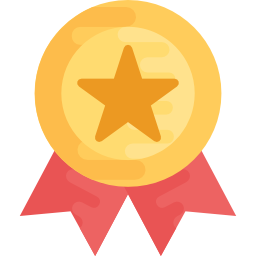 Hiding the Achievement’s requirements from the users will create a pleasant surprise when receiving the Badge (or any Achievement Symbol) and will also spread the sense of unpredictability among the community. CD8 motivates through the fear of losing something or having undesirable events transpire. Some ways of implementing CD8 as a Type is to ask for a reasonable amount of commitment like log-in streaks, or to prevent users from doing Undesired Actions. Once you have the Core Drives concept clear, you can add new columns to your file. You made it to the end of the first part. I just gave you the two first right tools to craft meaningful Achievements from scratch using the Octalysis framework. We will now craft an Achievement, step-by-step. Let us use Facebook as an example. One of Facebook’s main Desired Actions could be uploading content to their platform. Now that we know the Desired Action let’s go ahead and type it down. We just decided that the main Core Drive for this Achievement is CD2, as it empowers the user with a sense of development and accomplishment. The Type we chose to evoke this Core Drive is “High Quality”. The Octalysis Group loves helping companies think about how to engage their audiences better. Your users matter and they will make your business thrive if you motivate them correctly. We can help you design unforgettable experiences for your audience. We have a long and proven track record of creating high ROI engagement designs. Contact us for a free consultation.